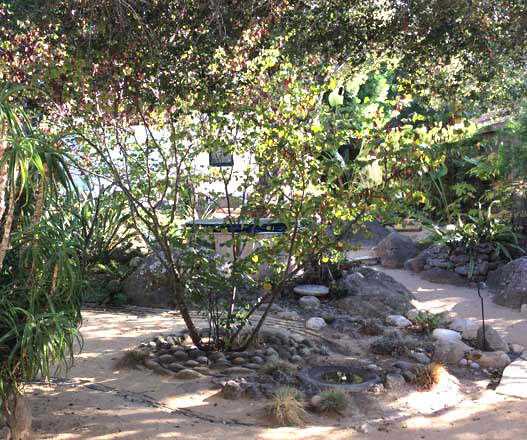 Pacific Horticulture Society | Where Did the Water Go? 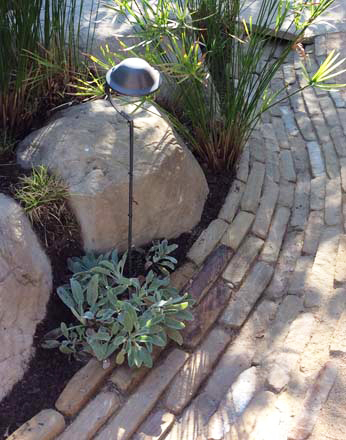 This is the first in our 4-part series entitled Water-Sensitive Landscape Design (WSLD). Throughout the year we’ll explore what a water-sensitive garden is and where gardeners can go for professional guidance. We’ll focus on the basics: soil, carbon, water, and plants, as well as cover alternative technologies and resource consumption. And always, our focus is on design: how is it changing and what is the new “beautiful”? A shifting paradigm is creeping across California and, not surprisingly, the focus is on water. Undeniably, we cannot continue being insensitive to the water needs of our gardens, no matter what climate change has up its sleeve. Approaching the issue from a watershed perspective means stepping back and focusing on a region’s geography and hydrology with the involvement of all stakeholders, and making decisions based on the health of the whole system. We didn’t see it at the time, but even growing up in urban Los Angeles we were affected by our watershed. These lessons made an impression. It wasn’t until years later that we recognized the power and limitations of water and its impact on topography, agriculture, and recreation. A landslide. A field of flood irrigation. A temporary lake. 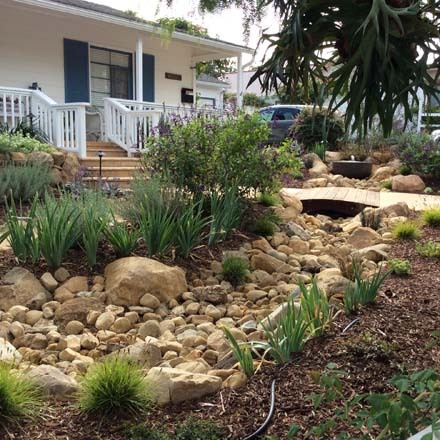 Paula Henson is a designer, educator, and water conservation/rainwater harvesting consultant with Urban Water Group in Los Angeles. On a stormy night in 1969, our backyard disappeared. My family’s home was perched on the edge of a canyon in the Santa Monica Mountains, blessed with beautiful views and ever-rising property values. We had our share of uneasy interactions with critters that came up from the canyon now and then. But it was our backyard, complete with the standard 1960s Jungle Gym. It had been a particularly wet winter. One morning at dawn, a neighbor alerted my parents that the slide had stopped about eight feet from our back patio door. Our whole backyard had slid down the side of the canyon. Panic (parental) and bewilderment (children) ensued as we packed ourselves into the station wagon and evacuated to avoid the very likely possibility that our house would go, too. Later, oblivious to the nightmare of insurance, inspections, and liability for the neighbor’s house below (now blocked by our former backyard), my sister and I relished the excitement of a construction project in our own backyard! As was to be expected, my family just rebuilt with a bit more rigorous engineering. Many yards of concrete and several 80-foot-deep caissons later, we had a new deck from which to view the canyon sunsets. Man conquered nature. Moving somewhere more…geologically sound was not considered a serious option. Our interface with the canyon was cut off. Whatever danger lurked on that hillside was now beyond our reach; in fact, it was beyond our sightline. “Under the deck” took on a scary, ominous meaning. One did not venture there alone. Perhaps we were tempting fate or Mother Nature by living on the rim of a canyon. Balancing on the edge of a cliff, powerless to alter what was going to happen, we were poised at the precipice of our watershed without even noticing it. 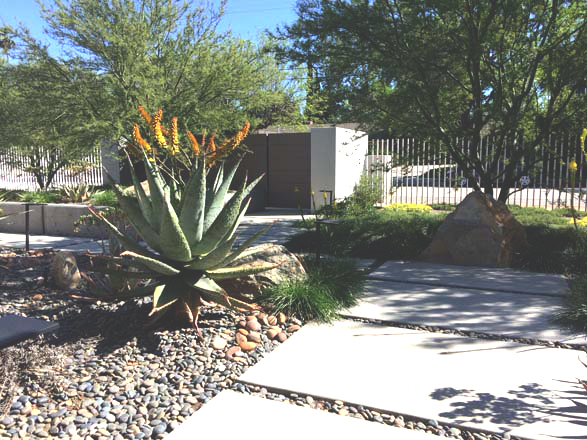 Tom Rau is a licensed landscape architect with Urban Water Group, specializing in the design of watershed-wise gardens for residential, commercial, and public projects. In the early 1970s, my parents bought a modest ranch home built in the midst of a grapefruit orchard in north Phoenix, Arizona. As with much of Southern California before suburbanization, the city of Phoenix was surrounded by agricultural land. Flood irrigation with water imported from faraway places courtesy of the Central Arizona and Salt River Projects was common. Rather than taking the ”scorched earth” approach beloved by current housing developers, only the trees necessary to build the homes were removed in the construction of our subdivision; the rest were left intact. 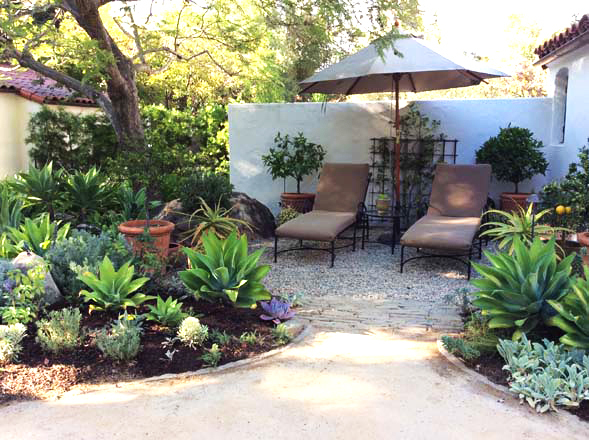 Not only did the trees continue to bear fruit, but their shade canopy provided protection from the desert sun in both the front and back yards. The shade also made our swamp cooler’s job a bit easier. But on the downside, the trees were hosts to armies of cicadas whose incessant chirping was often deafening during the seemingly endless summers. It was during those long, blazing summers that my sister and I, 5 and 10 years old, eagerly awaited the monthly flooding of our yard. A man from the irrigation district would arrive to open the large gate valves that diverted water from an open ditch onto our property. The resulting deluge turned the entire yard into a great big pond over a foot deep. 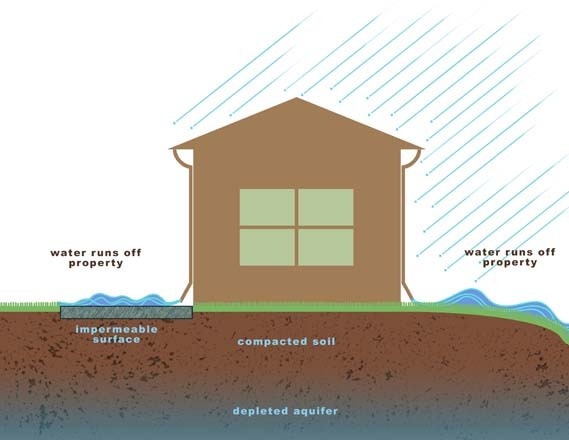 To keep the water on site and out of the house, the property was encircled by berms and our house was on an elevated pad. With the much-anticipated arrival of water, the yard became a giant “slip and slide,” in which we could frolic well into the evening, staying cool as temperatures dipped into the 90s after being well above 100 degrees all day. Waterlogged and covered with grass clippings and leaves, we were eventually ushered back inside and forced to shower before being sent to bed, exhausted but refreshed. 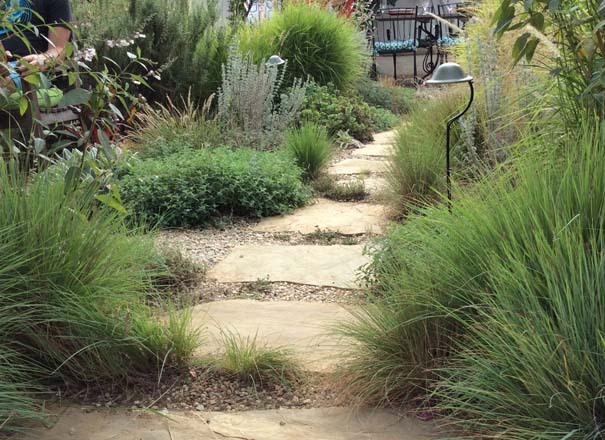 Marilee Kuhlmann is a landscape consultant, sustainable garden designer, and President of Urban Water Group. 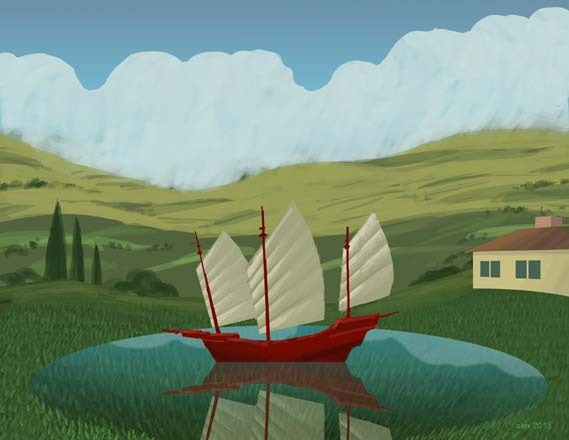 When my father got out of the navy after World War II, he, like many of his age, bought his dream house. Ours was the last house on Oxnard Street in the west end of the San Fernando Valley. The three-bedroom, one-bath tract house was purchased for $1,400. Dad quickly began adding rooms both to the house and the garden. He was a man on a mission. He added the ironing room and a new room that would become the TV room a few years later when we got one of those devices. But the most curious room for me was the sunken garden room. Using all the digital technology at my fingertips today, I’ve calculated that the sunken garden was approximately 2,800 square feet wedged in between the pool deck and the orchard. Why he dug it three feet deep is now a great mystery about which I am left to come to my own conclusions. This part of the garden was turf; two rolling turf steps formed an entrance at one end, surrounded by three-foot slopes on the remaining three sides. In a corner at the bottom of the sunken garden was the first of many rock waterfall features that Dad would create during my childhood, each having grander and grander water works. This one was a simple cement dish with a pile of rocks cemented together with cascading water filling the “pond” filled with goldfish. It was an adventure garden. Tom Sawyer’s island at Disneyland had nothing on my father’s creativity. In the late 50s there was a huge rainstorm. That is not a common statement these days. It was as big a deal then as it would be today. Six inches fell over two days. The morning after, when I went to explore the storm’s effect on my outside world, I found to my great amusement that I really did have Tom Sawyer’s Island right in my own back yard. The sunken garden had filled with rainwater all the way up to the top of the 3-foot slope. It was Lake Oxnard! Of course the only thing to do was grab one of Dad’s homemade boats, which we used to navigate the swimming pool. I chose the red junk; it seemed to be the best one to cross into my other world. That day in school was one of the longest of my life. Running home I planned my adventure for the rest of the day: boating, maybe fishing, or just rowing and floating. I invited all my neighbors to join in the fun—boat races would be done in turns. I went to the lakeshore and to my amazement the lake had disappeared, only little pools were left. I just stared at the soggy turf. Where did the water go? I spent the remaining time that afternoon collecting goldfish stuck in those pools, returning them to the concrete pond in the corner that still had water in it, and contemplating what had happened. It was a true watershed moment. 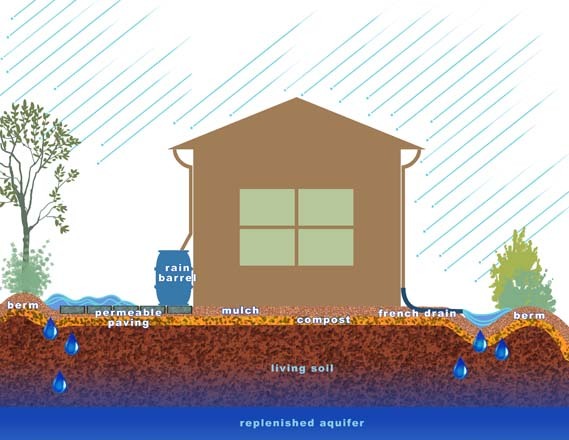 Today with each rain garden I design, with every water feature put in the right place, with each cistern brought to a site, I hope that each will fill as designed. I think of my father often, wondering if I inherited a water collection gene? Or do we all own a watershed truth in our nature? I hope for rain, it fills me with joy. Gardening from a watershed approach is about leaving trees in place to hold onto our hills, it’s about using plants that thrive on the rain we get locally. With El Niño in the forecast we’re looking at ways to capture as much of the potential volume of rain as possible. But we also need to understand when we’ve got too much of a good thing and create conditions that allow excess water to recharge our watersheds.